One of the best things about having a relatively old device, like the Samsung Galaxy S II GT i9100, is that you will always find the help needed to root it or make any modifications you see fit. This is especially true for high end devices that have sold very well during the last quarters. This article is aimed at providing you with an easy and safe way of rooting the Samsung Galaxy S II GT i9100 if it is running on the latest official firmware: ICS XXLPQ 4.0.3 Firmware. This is the firmware version that comes with the barely released ICS update. Before we move on you should know a couple of very important aspects regarding rooting any Android device. If you decide to root you Samsung Galaxy S II GT i9100 you will most likely void its warranty, so if you are uncomfortable with this, you should probably stop here. Our disclaimer notice is next: As with any software that is not our own creation, we must warn you that you cannot hold us responsible for any damage that might occur to your device by following the procedures in this guide. However, we will try to help you sort out any glitches or problems that might arise by following the steps in this guide to the extent our knowledge limits us. this does not mean that the rooting procedure is flawed, but rather that in any tested thing errors might occur. Make sure that your Galaxy S II is charged to at least 50% in order to avoid running out of battery during the rooting procedure. You also need enable the USB debugging option that you can find by following this path: Settings > Applications > Development > USB debugging. You will also have to disable or unintall any anti virus or security software you are running on both your computer and Galaxy S II. The first step in this guide is all about downloading the right bits of software and we will begin with this pack here: XXLPQ Rooting Package. This package contains the essential tools needed to root the Samsung Galaxy S II running the official ICS XXLPQ 4.0.3 Firmware. Be sure to extract the files in the rar archive before proceeding further. The second step consists of starting the Odin application from the downloaded pack and rebooting your phone into download mode. In order to do the latter you need to power off your device, remove and then re-insert the battery. Then you need to simultaneously press and hold the Volume Down Key, Center Key and the Power Key. This odd combination should result in a green robot indicating that download mode has been enabled. The third step involves connecting your phone in download mode to the computer already running the Odin software and waiting a couple of seconds/minutes for it to recognize the device. You can check when Odin has recognized your device by looking at the color of the ID : COM window. If it is yellow you are ready to proceed. 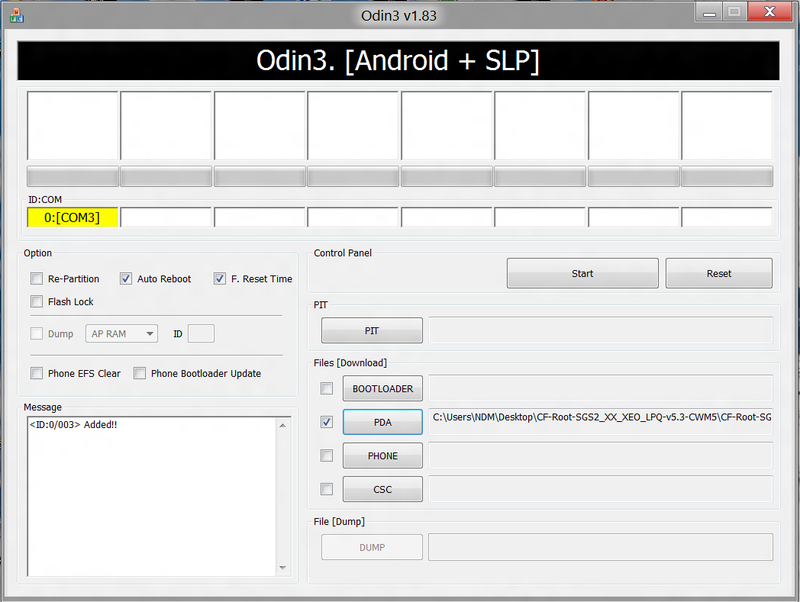 The fourth step is a little bit trickier as you will need to click on the PDA button in the Odin software and select the “CF-Root-SGS2_XX_XEO_LPQ-v5.3-CWM5” file located in the pack you have previously downloaded. The fifth and last step is the easiest so far, and it only comprises of you pressing the Start button in Odin and waiting a couple of minutes for the firmware to be flashed on your phone. As soon as the flashing process is complete you will see the phone rebooting and once you see the home screen you can rest assured as the rooting process has been finished successfully. In order to check if everything is in order you should power off your device and enter recovery mode. You can enter recovery mode in exactly the same way as you have previously entered the Download mode. From here on you can check out the various options your newly rooted Samsung Galaxy S II has. We recommend doing a nandroid backup now in order to have a working copy of the rooted software ready. Now how to root my phone ? than how to install Pure Look S3 ?